All About: POINT - Aspire & Co Ltd. Although we have outlined the point products in our previous post, we wanted to talk again about the innovation that is the POINT complex, as well as to take a moment to recognise the cause that the POINT products are going towards. The range consists of three results driven peptide ointments. Research has shown that peptides can help revitalise those building blocks and, in turn, help revitalise skin. Peptides have immense potential in anti-ageing skin care, helping to control melanogenesis and to fight glycation and even to soothe sensitive skin. Peptides are fragments of proteins. On their own, peptides are made up of amino acids. When amino acid s are combined in certain formations they create specific peptides (and there are hundreds of peptides), and when peptides are formed in a certain way, they make specific proteins, which is why they are so great for the skin. Without peptides, skin doesn’t remain intact and the results is loss of firmness, appearance of wrinkles, texture changes, and skin that doesn’t bounce back as it once did. That’s why the POINT range is made up of three products designed to help skin reverse back to it’s healthy state. The POINT MULTI-PROTECT is a peptide infused anti-ageing moisturiser with sun protection factor 15. Formulated for delicate skin or skin affected by environmental stresses. A unique moisturising cream that repairs, hydrates and protects the skin. Ideal for daytime use. The POINT EXTRA FIRM is a powerful and luxurious firming cream that is formulated with the unique combination of ingredients including a peptide complex to support skin’s natural proteins. The result is the appearance of refined facial contours and skin that looks smooth, firmer, and lifted. 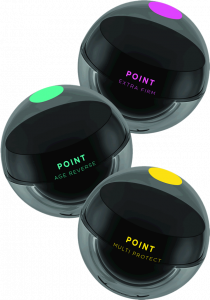 The POINT AGE REVERSE is infused with a cocktail of peptides and botanical ingredients to help reduce visible signs of skin ageing and promote skin firmness and elasticity. Following the death of her father to MND Petru Van Zyl pHformula CEO decided: “A life changing experience has led me to dedicate the POINT line of products to my father”. POINT will contribute in fundraising, creating awareness and will also provide personal support to the families. With every point product purchased, we contribute towards fundraising and create awareness about Motor Neuron Disease to support various (MND) foundations worldwide. Explore the products further to make a difference today.